Virgo is often so self-effacing, even demure, when contrasted with the previous bold sign of Leo, that we tend not to sit up and notice as it travels on by. But not this month! 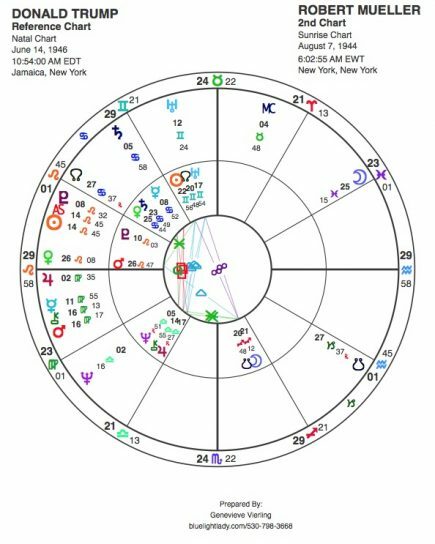 While the Sun stands alone, without support from either Mercury nor Venus, right now we actually have a Grand Trine in Earth (see Full Moon Chart) supporting this modest of signs. EARTH predominates with all earthy signs represented. Sun-Uranus-Saturn create an impetus to move slowly but surely ahead through exacting methods. Can you use this energy in your life? Yes, you can if you see where to apply it. In the Full Moon in Pisces chart we see the possibility of gaining tremendous insights and compassion as we solve problems that are often overwhelming in nature. It’s a good time to unite with others and not go it alone. I think of an example in our own family’s life where my husband’s sister-in-law fell and broke her hip and elbow a month ago. She has the beginning stages of Alzheimer’s which complicates matters. After a long month in the hospital and two or three surgeries including one for her heart, she is about to be transferred to a good residential care facility where her husband can join her and they will have the help they need. Her many children rallied and helped tremendously and one of her daughter’s used Facebook to share and gain further emotional and morale-lifting support from her many friends. I’m sure you have stories of your own from this past month of so many planets retrograde, and so many hurdles to overcome given the energies unfolding. Virgo and Pisces go together as part of one great continuum. Neptune in Pisces has brought both chaos to the collective but also oneness and a sense of compassion. Let’s not forget that. 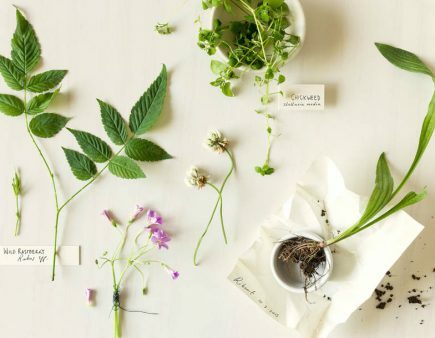 Virgo is a great grounding cord for Pisces and needs to give us the right tools and problem-solving methods to fix things and get on with life on Earth. Apply these principles wherever they fit in your life. We have had three planets in Capricorn: Mars, Pluto, and Saturn. All retrograde right now as I write. What are the words best describing this trio? Persist, persevere, endure, get organized, be pragmatic and productive. Combined with newly activated Uranus in Taurus we can now add exciting resourcefulness to the mix. A whole host of developments may emerge from this time period that are constructive and solution-oriented. Let’s promote those. Yes, we are dealing with wide-spread destruction as well. We in California are highly aware of that. People in Hawaii are aware of a different kind of powerful destruction right now. Both Fire and Water are enormous issues. Too much or too little water is with us now. Too much Fire is another problem. I’m hopeful that this Earthy time will find some solutions to slowing down the global warming that we’ve seen coming for a very long time. I started saving articles and tracking it in the late ’80s and early ’90s. It’s unbelievable how slow we are as humans to join together consciously and learn to live on a planet with respect for her needs. Sometimes I wonder if we really belong here at all???!!! Which brings me back to what Virgo is all about. Out of the negative of Leo, which is hubris, comes humility which is what Virgo has to teach us. We have a good example of that now in the exposure of more Catholic priests, so-called representatives of an Almighty God, who for years and years sadistically destroyed the innocence and natural sexuality of children. This is core criminality and downright evil in my book. The human race is full of this kind of behavior which Jeff Green so rightly termed the Virgo/Pisces dilemma of sado-masochism where the old Piscean Age of ‘savior/victim’ perpetuates the imbalance. How will the Church ‘Fathers’ handle this latest scandal? It can’t be shoved under the rug as too many secrets are out now. And that’s where the Capricorn purge comes in to play. Ancient secrets are being revealed everywhere right now. That’s Pluto in Capricorn. True Virgo humility requires resolve to end addictiveness (Pisces) and the will to take one step at a time to change course and correct ones behavior. Quickly. Mars is about to turn Direct at the very end of Capricorn on the 27th of August. The Sabian Symbol of 28+ Capricorn is ‘A Woman Reading Tea Leaves’. This is a symbol of predicting the future. There are many forms of prediction. Virgo forms might actually be statistical. Each of us has intuition. So keep your intuitive mind open right now for the signs and symbols that speak to you. Watch for nonverbal clues as you seek guidance within the ordinary of your day-to-day life. Find your own methods of divination and use them. Using them is a Virgo practice! Mars will leave this degree by September 4th, and move forward into Aquarius again starting September 11th where it will finally finish what it started way back in mid-May by October 10th. Whew! It’s been a long and winding road. I’m going to switch gears and look at a political figure briefly to illustrate more about the nature of Virgo: Robert Mueller. I am not going to express an opinion pro or con about this man because I don’t know him and haven’t studied his life that deeply. What we read in Wikipedia is that he is an American attorney who headed the FBI just before the 9/11 Trade Tower incident, and that in his younger years he served as a Marine Corps officer during the Vietnam War. He was highly decorated for that service receiving the Bronze Star Medal with Combat ‘V’ for heroism and the Purple Heart Medal. He began to head the ongoing investigation into Russian interference in the 2016 U.S. presidential election and ‘related matters’ in May 2017, during the time of Taurus. 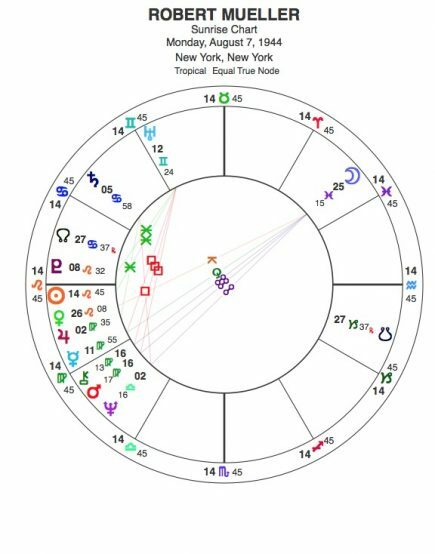 Take a look at his Sunrise chart, for no one has correctly stated his time of birth on-line. There is quite a line-up of Leo/Virgo energies. The Pluto/Sun in Leo shows his strength and persistence once engaged, but all that Virgo shows his blood-hound drive to uncover detail after detail and analyze the results. First we see Jupiter in Virgo which describes his ideal, his sense of order, his virtue and reliability. We have a grandson with that placement of Jupiter. He loves to line everything up and call it a ‘parade’, he also loves small things and is highly detailed oriented. Mueller compounds this quality with Mercury in Virgo which is in its dignity and exalted, and gives him that double dose of precision and methodical thinking, Not to be ignored, he follows with a tight conjunction of Chiron and Mars in Virgo increasing his critically careful and precise aims and perhaps identifying with the ‘Sacred Warrior’ that Chiron here implies symbolically. 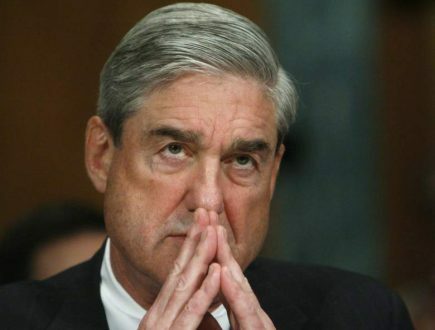 Bloodhound Mueller is what I call him. Never give up. Sniff, sniff, sniff…..And Uranus entering Taurus is finally activating these long months of careful toil I would think, and Saturn in Capricorn is gaining him some fairly solid results. Will this Full Moon in Pisces bring some kind of culmination for his Jupiter efforts? Transit Sun/transit Moon highlighting his legal note. In fact, he was born with Moon in Pisces very much opposite his Mercury/Chiron/Mars in Virgo. Perhaps he is drawn to chaotic situations like the Vietnam War certainly was. Does he have universal consciousness and a sensitive attunement to all that he relates to? The potential is certainly there. Or is he caught up in the ‘frog in the well’ perspective with all that focus on the microscopic without a clue for the bigger picture that transcends politics? I don’t know. It appears he struggles with his beliefs and idealism as shown by Neptune square Saturn and possibly also opposite his Moon (with time unknown). Looking at his chart with the chart of POTUS some notable connections stand out. 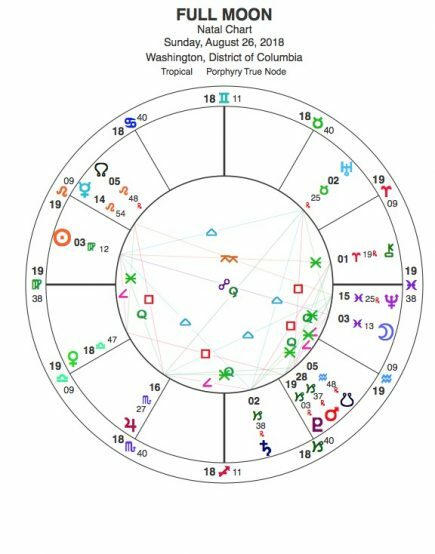 His Sun falls in the 12th house of President Trumps, and fairly close to his Pluto. He is not an ‘open enemy’. He illuminates some aspect of that Pluto hidden away. Yet also note worthy is the conjunction of his Venus on Trump’s Mars (love or hate—that’s Venus), and then we come to all that Virgo filling up the 1st house of POTUS. That’s quite an impact on his identity. I have noted in past articles that President Trump lacks planets in EARTH, though he decidedly has AIR planets in his earth houses. 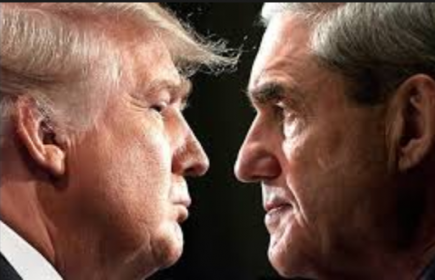 All that Virgo in Mueller must contend with a Gemini man who is like dancing lightening, here, there, and everywhere. The genius of Trump is his Uranus in Gemini—-mercurial to the core. Their Moons are square as well, indicating quite different emotional bodies. Moon in Sagittarius cares a hoot for sensitivity especially in a free-wheeling relationship with Sun in Gemini. This is quite a saint vitas dance in my book, between these two. 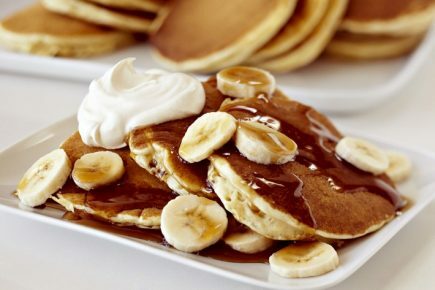 I get the image of the child’s story about the run-away-pancake and the fox. Ooo! But who knows where this will all go, and I’m not sure Mr. Mueller is a man of vision. His focus, like a blood-hound, is right on the ground where he finds himself, though note that he was born with Mars square Uranus! He can be quick on the draw when he needs to be, and accurate too. Is this almost like a Wild West gunslinger story? But—stop—-there’s one final connection that catches my eye: Mueller’s Saturn on Trump’s Mercury. Is there an element of fear here? Saturn tends to restrict Mercury, and Mercury in Cancer is security and emotionally oriented. There’s a strong note of loneliness, and depression in this connection that touches BOTH men I feel. You can sense the world-weariness of this strange chase for both men. Looking at the transits for POTUS we see that Pluto in Capricorn in his 5th has dogged him completely from the beginning of his presidency, but things have become especially egregious with Mars joining and now Saturn entering this sphere of children/romance/creative-expression and fun (????) for the next 2.5 years. The oppositions to his Cancer planets will continue solidly for a very long time to come. These are relationships that are anything but light and fun. I want to leave all the drama of political theater, and now turn our attention to real live, richly beautiful Virgo women that I know. Most of these talented women you can not find on-line by any type of search. I have known all these first four for a very long time and experienced first-hand their skills. Naima was my massage therapist on a regular basis many years ago. She still practices that craft but has also developed another vocational skill which is photography. After living in Nevada City for many, many years she moved to Sante Fe which her earthy Sun in Virgo just loves, and she photographs the big sky and high desert mesas beautifully in her ‘Soul of the SouthWestPhotography’ card business. This second woman is about to start a brand new life in her home country of Chile after living and working in the Bay Area where she was a skilled esthetician for many years. Cecilia is an animal lover and has worked with rescue centers. In fact, she is taking her foster/adopted cat with her to Chile showing the devotion and love that her Full Moon in Pisces nature epitomizes. The third is Juliann who used to have a bonafide organic pet products business called Juno’s Garden with core brands for pets called Pal Dog and Pal Kitty. She offered a full range of products for many years but finally sold her business and is now living in the Foothills of the Sierras where she helped to design and build a beautiful home and now continues her Virgoan avid gardening skills. I might add that she has successfully assisted her husband’s photography business in SF which—-yep—-is all about food. Can you see some major Virgo themes at work in these lives? I have one more however! Our beautiful daughter-in-law, who just gave birth and is now a devoted Mama to a sweet Leo baby girl, is also a PhD psychologist who has specialized in two very different fields; sports psychology and screening for autism. 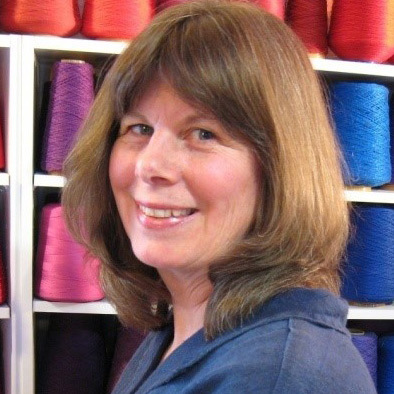 I might add that she is also skilled in needlepoint, and a great cook and gourmand! And she practices yoga—-very, very Virgo to the core! Now I’d like to celebrate three more women who are more publicly known and whose information you can find through any search engine on-line. Barbara Murphy-Warrington has Sun/Mercury conjoined in Virgo, both in trine to practical Jupiter in Taurus. 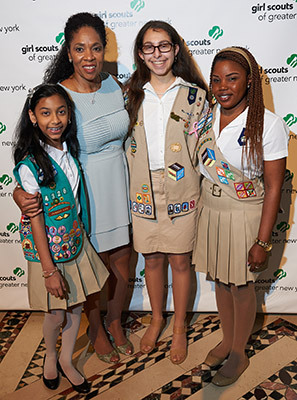 She was very active as the Chief Executive Officer for the Girl Scouts of Greater New York for many years. What a kind and caring leader she is! She upgraded that organization during her tenure and I’m sure improved the lives of many underprivileged girls as well. 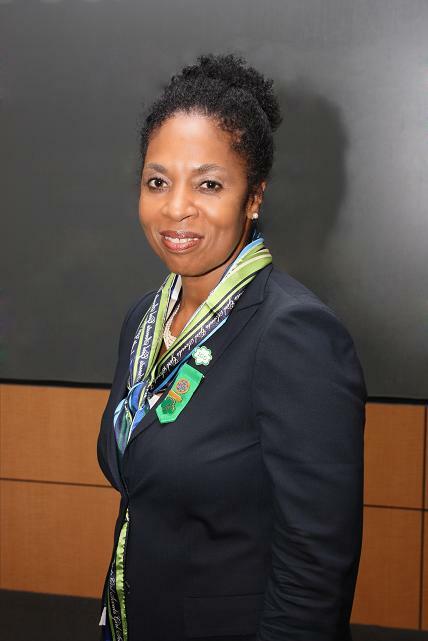 Now she is back at work as a Principal at The MiraLite Group LLC in Cambridge, Massachusetts and lists on Linkedin as her key areas of focus: Diversity and Inclusion, Strategic Leadership, Coach/People Development, Organizational Change Management, Urban Leadership Program Development for under-served girls and women, Public Policy and Advocacy on S0cio-Economic Disparities, and Partnerships. 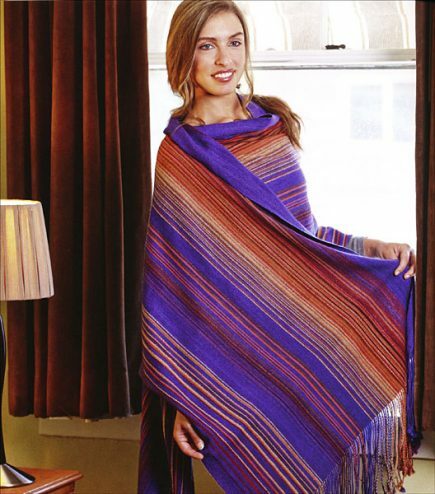 All of her Libran planets play a role here in her uplifting equality, fairness, and harmony with her community. I might add that she holds a Juris Doctorate from Rutgers and, Master of Laws in Tax from New York University. This is one accomplished Virgo woman!! 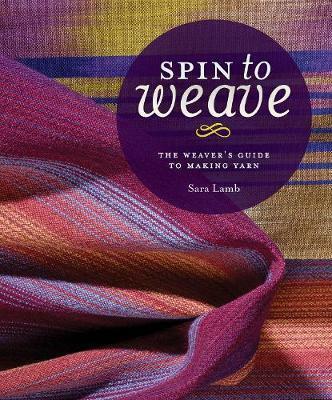 Sara Lamb lives locally in Grass Valley, California and she once gifted me with one of her bright and beautifully woven dish towels that I use constantly as it enhances our kitchen! 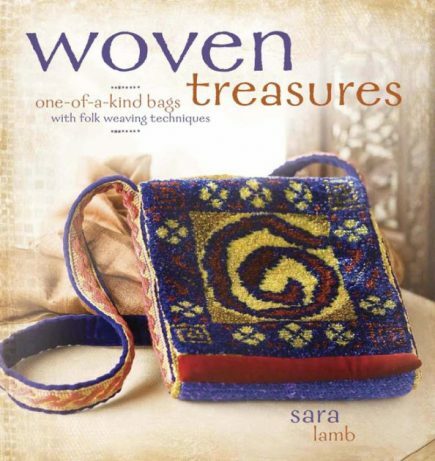 Sara epitomizes the crafts woman/artist with three planets in Virgo; her Sun, Mercury retrograde, and Venus retrograde. Just look at her beautiful and meticulous work! Not only that, but she is so gifted as a teacher and travels the world sharing her knowledge with people as far away as Australia who revere the ancient craft/art of weaving. 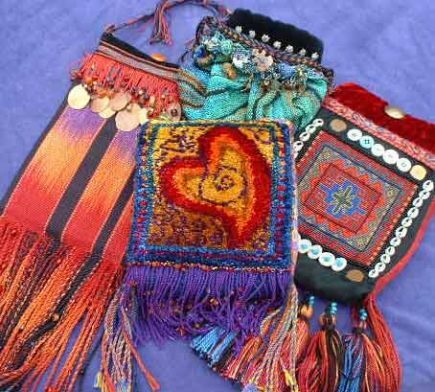 One time she brought to my study group her beautifully rendered and magical bags which embodied themes of The Goddess. They should rightfully be in a museum! You might want to check her blog and website out or pick up one of her many books on the subject. She is truly prolific! Finally, I’m celebrating Heidi Merika who does live in far-off Australia. 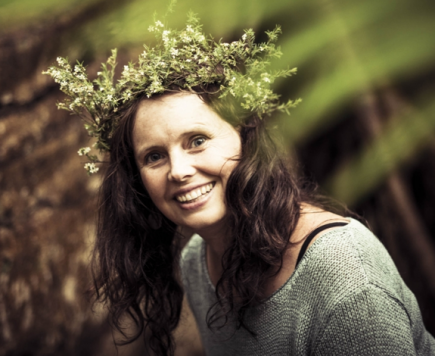 As her web site states, Heidi is ‘an experienced naturopath and medical herbalist with a passion for wild medicinal and nutritional plants. She, too, travels through-out her vast country speaking at conferences and seminars, and running workshops. I especially like her work on the benefits of breast milk and her endeavors to educate all of us on-line about vegan diets and wild-crafting herbs. If I lived closer to her, she would be my ‘go to’ naturopath! And isn’t she one of the prettiest Virgos you’ve laid eyes on? Oh yes! Like the other two, she has Mercury and Sun in Virgo, but adds to them her Mars in Virgo. She is a go-getter and no wonder she wears so many hats, yet all involve the many skills of Virgo. 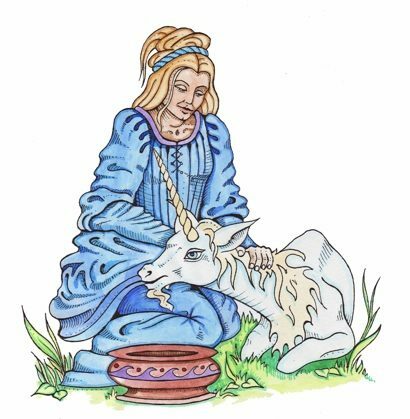 I feel with all these women I have illustrated what Virgo is all about: food, clothing, small animals, service to others, the healing arts, bodywork, gardening, domesticity, crafts… Can you think of some others? We need Virgo in a multitude of ways to keep us functioning and healthy on Mother Earth. Amen to all of it!